Bend-the-Rules Sewing: The Essential Guide to a Whole New Way to Sew by Amy Karol. Amy Karol runs the blog Angry Chicken where she posts inspiration and creative stuff. 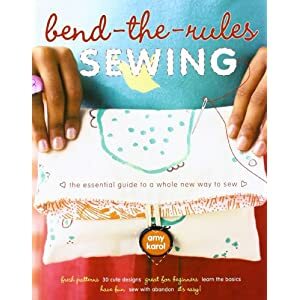 I recently picked up her book, Bend-the-Rules Sewing and wanted to let you guys know how awesome it is. I haven’t created any of the projects yet, but I’ve read through the book a couple of times, and seen a few things I definitely want to make. My favorite projects in this book are probably the cute handbags and clutches, Like the artsy clutch featured on the cover of the book. Overall, I’d say that this book is perfect for beginners and those just learning to sew. It tells you the tools you need to sew, the techniques, and tells you how to use the patterns in this book.